I have several projects going on, but by doing that the layout that I'm hoping to construct is being neglected. Last year, I tore up part of the layout because I wasn't happy with it's operational qualities and it had some reliability issues too. 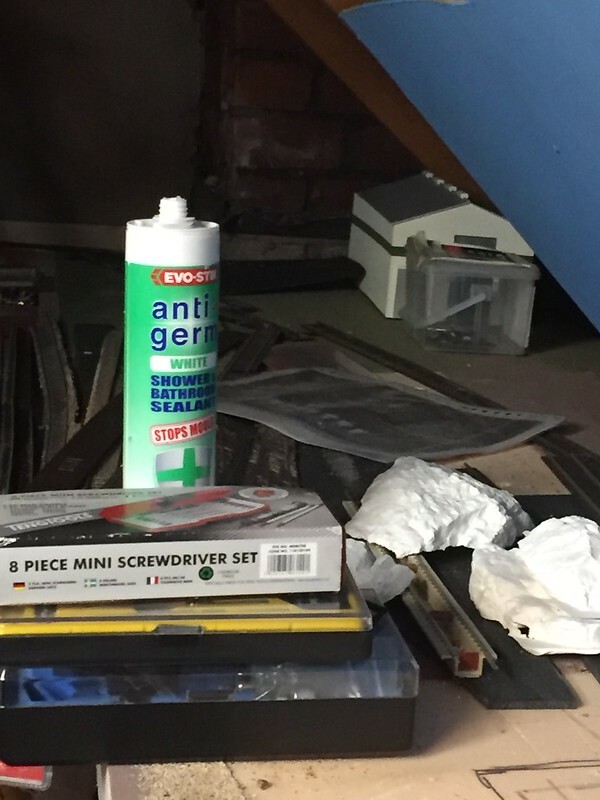 Then on top of that, circumstances surrounding my job meant that I had to drag a lot of 'stuff' back from my work apartment in Holland, to my house in the UK, and it all ended up scattered in the loft, and on top of the torn up part of the layout. So my challenge is: Tidy up the mess and construct a new yard. 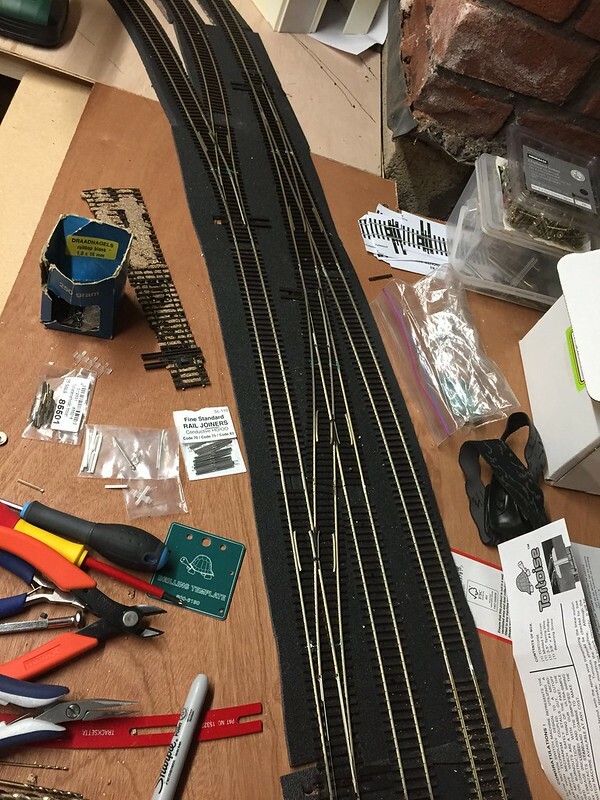 My goal is to have at least all the track in place , wired up weathered and ballasted before the end of the challenge. 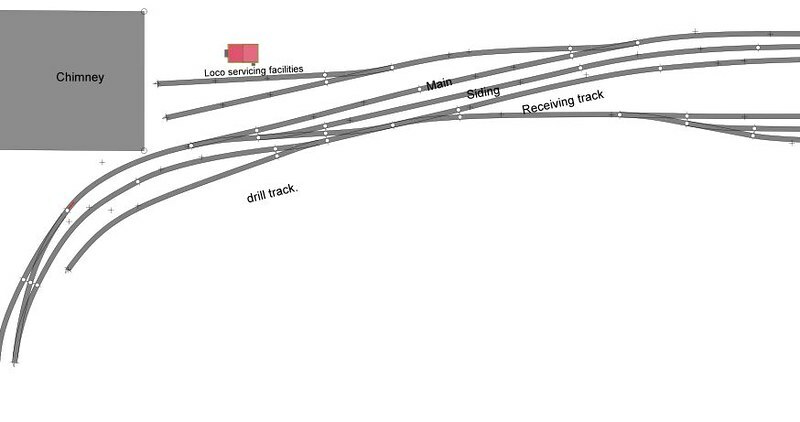 To give you an idea , here's the trackplan. Your new track plan looks good, can you add some photos? Here is the humble start of the project. Working from right to left, I've installed the first two turnouts. I have left the original foam boards in place. I am using small pieces of 5mm plyboard inserted under the turnouts to which (Tortoise) motors are fitted, which have been recessed in cutouts in the foam board. 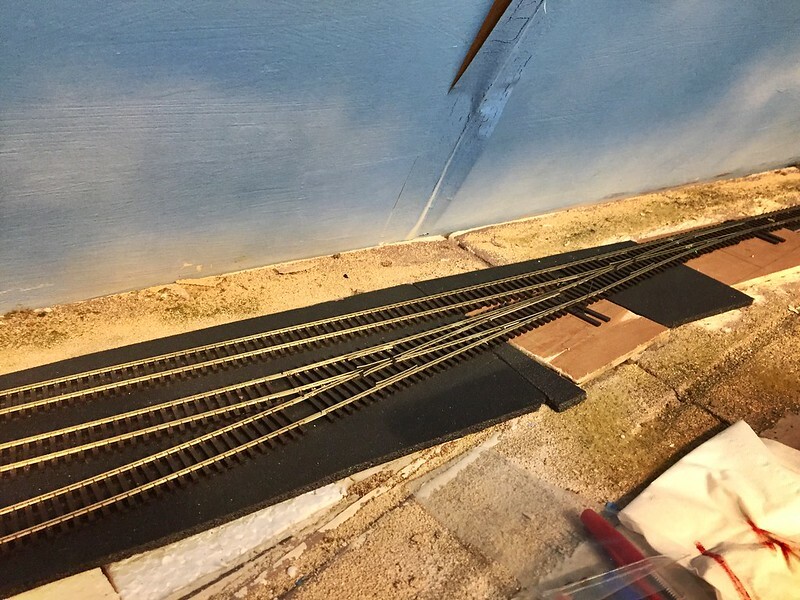 The rest of the roadbed is foam roadbed by Woodland Scenics. The turnout themselves are No6 insulfrogs by Peco. I would have liked No8's but they take up too much space so I will be using mostly no 6 and 5 for the home layout. I've also soldered wirebridges to the bottom of them (see if you can spot them) that are connecting the outer rails to the two shorter pieces leading up to the frogs, this will help in electrical contact and not having to rely on the movable 'blade rails' for electrical power. I've now got some power to the new trackage and just playing around with spacing and depot placement, none of this is set in stone as yet. As you can see there is still a lot to tidy up towards the left end of the layout (chimey brickwork visible in the background), and turnouts etc for that area are still to be purchased. The delaying factor is funding. I'm still waiting for some money that I'm owed by MRH magazine for my article in the November issue (SW900E project) which I've not yet received. As soon as that's in the bank, I'm ordering the next batch of track so I can get on with things, in the meantime, I've got time to tidy, and do some bench work. The yard ladder has been laid and toroise motors fitted to all turnouts here, but they still need to be wired up. I've added some new base board and continued laying track around the left curve, including the pair of curved turnouts. 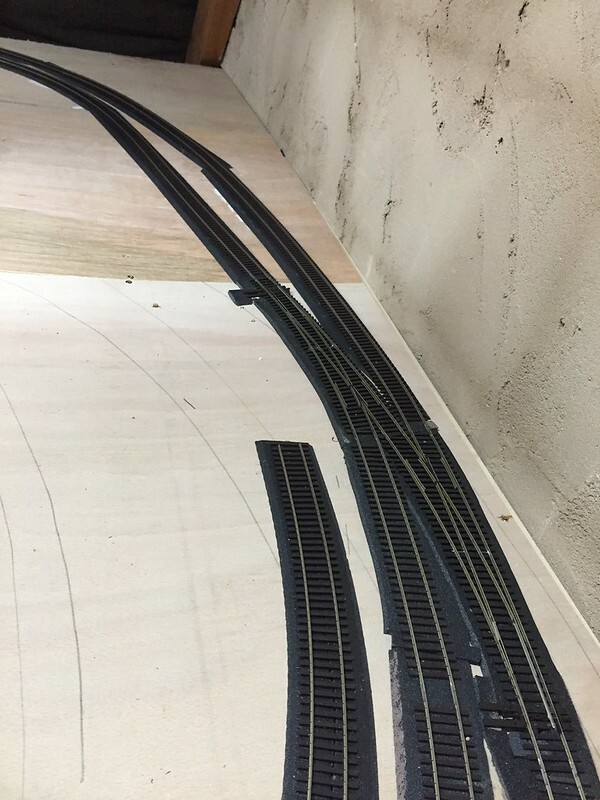 all track is placed on woodland scenics roadbed. 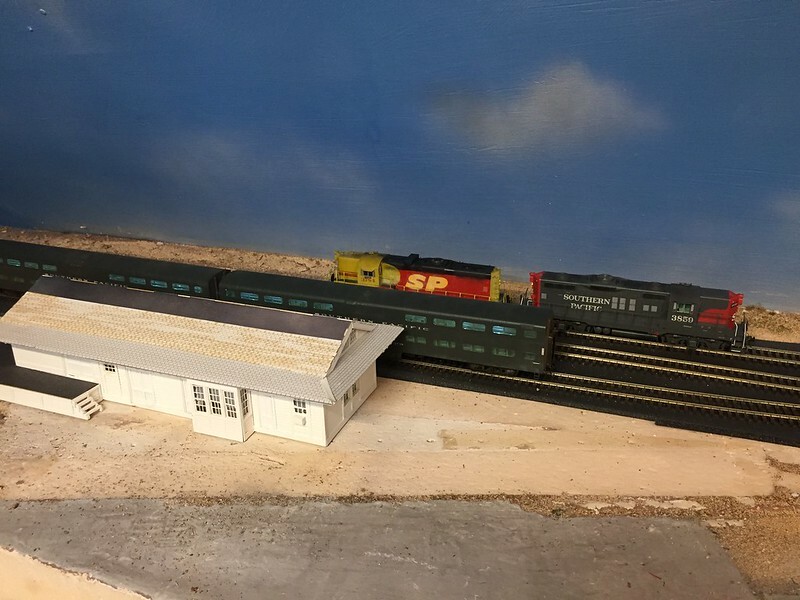 This now means that I have joined the track to the other side of the loft and for the first time in 20 years, I've been able to run a train around a loop the length of the layout, and instead of using Bachruss saddles, I can run locos in on the layout. Next will be to work on the additional yard tracks, wire all motors up, and then paint and ballast... considering the finish date is looming, I've got my work cut out. Well the final night of the Challenge is upon us. I failed miserably this time completing mine. This is due to having too many other things going on both inside and outside the model railroad hobby. I won't bore you with the stuff that distracted me outside our hobby, but inside the hobby, I stripped, detailed, repainted and installed sound in a P2K GP9, the result of which can be seen in Roundhouse of April 2017, so that took time away from actually building the layout. Also, I received 6 Wheels of Time SP flat cars that I started weathering and building loads for. That also distracted me. While I've now managed to complete 95% of the track work,and can run the above mentioned GP9 around pulling these cars, I've only managed to wire up 2 of the new turnouts so far, but it's a start. So no, I didn't finish, but I accomplished a lot more than I had expected , I now have enough track that for the first time in many years, I can run a train around while just watching it or working on a layout, and that's something I've not been able to do in years, so all is well in my house. Hi Koos, it's all progress no matter how small the step - and getting the opportunity to run your trains where they go somewhere is what it's all about - well done.